Raised £15,000 to go to Africa! 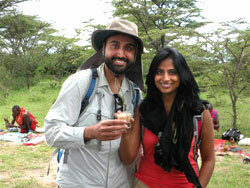 We planned an awesome 17 day honeymoon in South Africa, Rwanda & Kenya and itemized every element. Passes for gorilla trekking, hiking boots, massages, dinners and even vaccinations! We uploaded pictures for each item, to really give our guests a feeling of buying something tangible, rather than giving cash. They loved it! And we did too. We got to use our gifts for memories we'll always cherish. We were living in an apartment and had all the kitchen products we needed. Filling a registry for a future house seemed quite frankly silly. This was WAY more useful for us. Most people buy gifts online, so by putting a picture next to ALL our items, it was a comparable experience to online shopping. We did hear from a lot of doubters that they loved our Honeyfund site. Loved it. We had to add more items as it filled up! They thought it was real creative.